I'm an account manager for a financing company, and I've been with the company for a little over ten years. I was promoted, and moved to a new branch 3.5 years ago. From the beginning, I never really felt comfortable with the my new coworkers, and more importantly my new manager. The manager was passive aggressive, in that she seldom said hello in the mornings, but I didn't pay much attention to this, as she seemed to do it to others as well. I've always managed to get satisfactory and fair reviews of my work, and the raise and bonus that came along with it. Most of my coworkers were fine, and I got along with mostly everybody, with the exception of one lady. She would make rude comments and act above everybody else. She constantly needed the attention to be on her, and I realized something was wrong with her, when I caught her laughing in the parking lot when a coworkers car would not start. She seemed to take pleasure in others peoples grief. She began stopping by my office frequently, and at one point she began crying saying how bad things were for her. I didn't realize it at that point, but this was a pity play, a common tactic of sociopaths. I noticed that she would want to try to control what I was doing, and trying to manipulate me by being super nice, one day and extremely mean the next. I had enough, and decided to keep away from her. I only spoke to her if I met face to face with her in the hallway. This was a big mistake. I didn't realize it at the time, but this is considered to be a threat at being exposed by these people. Shortly after, I noticed that the people she was closest to me began treating me differently. They would laugh as I went by, or I would have rude remarks thrown at me. I managed to keep my calm, with one exception, when I told one of her friends, that she shouldn't be controlled by other people. After this, more people from my branch were recruited. It wasn't limited to my department. Everyday it stung a little more when I would have the same insult or innuendo thrown in by a new recruit. I tried my best to avoid these people, with the hope that they would stop when they could not get a rise out of me. With time, I noticed that at our regional meetings, people we're acting differently towards me, I would see people turn away from me, or look at me with contempt. I just basically denied it and went about my work. This spring things were not improving, so I applied for an opening available with a team headed by my old manager. I went through tests, and 3 interviews spanning close to two months, only to be told, I did not get the job. I stuck with my job, and things seemed to calm down, and became more manageable. I began feeling like the worst was behind me, and would go weeks with things being seemingly normal. I found out that a coworker just became accredited to do the same job that I hold, and was sent out to training. I didn't pay much attention to it at the time. WE learned a few months ago that our department was being merged with another. There were rumors going around that jobs would be cut, but we were assured by new management that this would not be the case. I forged on, doing well at my work. Last month the coworker who got accredited, went on sick leave. He apparently didn't take it well when no new position was available for him even though the company spent lots of money on his training. This last month the bullying is back, but this time, it's my manager who is taking the lead. She will laugh when she sees me in the hallway, and when we have one on one meetings. She is beginning to bring up errors that I'm making on irrelevant stuff, laughing as she tells me stuff. She is trying to gaslight me to make me out to be crazy. She also comes around to see where I am at with my sales objectives, stating that her boss wants to know. She never bugged me with stuff like that before. I'm also being ignored by people who I consider to be the closest to. They won't even look at me, and just walk by my office. I was at regional meeting, this week, and people would not sit close to me. One of them made a crazy face, at me when I said hi. I've never gotten written or verbal warnings ... yet, but the writing is on the wall. I think I've become expendable, with the downsizing, and them having a cheaper salaried employee trained and ready to take my job. There is correlation between the smear campaign initiated by the sociopath, and the actions by my manager. Basically, I feel like my reputation as been ruined, and the OK has been given to get rid of me. I kick myself for not getting that position I applied for. Being without work now would be extremely difficult on my finances, so I'm stuck waiting for the other shoe to fall. I have problems concentrating, I don't sleep well, and it's all I think about. I have anxiety attacks, about applying for different jobs, and being blacklisted because of this. I don't want to believe it, I still try denying it it, but too many things add up. Every morning I wake up feeling like crap wondering what the hell I will live through today. This was a dream job for me, and my friends and family don't really know what I'm really going through. I feel ashamed to tell them, like somehow, they would blame me. If I were truly as crazy as they make me out to be, they would fire me. They obviously don't have the grounds to. Yet I still feel uncomfortable discussing with family. Thanks for reading. One word of advice, listen to your gut, and leave early on. Start a rumour that you have a contract to write a book about sociopaths in the workplace. Wow I can so relate to your experience in the workplace. This is more common than you may realize – I’m from Australia. I was a bookkeeper at a small Solicitor and Conveyancing firm. My boss, who was male, was the only boss and I believe he was a narcissist. The rest of the staff, all female except for the son of the boss, was headed by a female bully. They chose me for elimination and it has been over 12 months since I was forced out and I still don’t know why I was chosen. I taught a coworker my job on the pretense that she would do my job for one day a week, so I could have a day off. I always wondered if I was doing myself out of a job. One day the boss stood over me yelled at me and shook his finger and blamed me for something that was not my fault. I had held the job there for 14 years. I had put up with the workplace mobbing for over 10 years. I loved my job, was loyal and conscientious, but that makes no difference when you are a target. I was isolated, ignored, my boss did not say ‘hello’ to me, my stationery was hidden by staff and I also noticed that coworkers that I thought I was close to treated me differently and so on. I have written on this site "Bullied by Stealth". 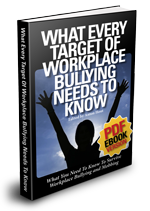 People often feel guilt about their inability to stand up to the workplace bully. They blame themselves for being manipulated or attacked. This self-blame and guilt can lead to confusion about the best course of action as the victim becomes caught up with anxiety trying to solve what seems like an unsolvable problem. Excerpt from "Working with Monsters" by John Clarke. I also found the situation difficult to discuss with friends and family as I couldn’t really understand what was going on. Please reach out to friends and family for help as their support can be invaluable. I understand that financially you need this job, but please try elsewhere as the toll that this sort of treatment takes on your mind and body can be extremely traumatic. You need to look after yourself. You don’t deserve to be treated like this. People can be so cruel and self-serving. You do not deserve to be part of their mistreatment. I highly recommend Anton Hout’s book ‘What Every Target of Workplace Bullying Needs to Know’. 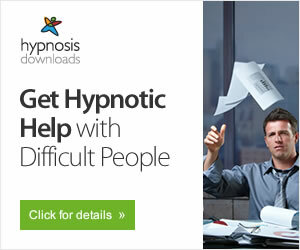 It is very well written, insightful and may help with your situation. Hi Vanessa, thanks so much for your comments. I truly appreciate it. I have to muster up the courage to start applying elsewhere. Right now I'm being held back by the fear of being blacklisted, or not able to find another job. I'm scared of being stuck without income. I have to realize that my health is more important. As far as my family and friends are concerned, I guess I just have to be honest with them, and hope they will understand. At times I do feel guilty, and I feel they would say ...well what have you done to serve it? In the end it's my life, and this might have been my dream job, but it isn't anymore ... I would love nothing more then finding a normal working environment, where I don't have anxiety every time I wake up in the morning, or dread making the walk to my office in the mornings. I take the blame for not being the most available coworker. I've always tended to keep to myself, being rather shy. I would always be ready to help someone. This was not enough. I was targeted as being the weakest link, and the easiest to go after. I think rumors and smear spread exponentially, and with the restructuring, and making more money then the trained employee, I am easy pickings. Just today I was the only one singled out for something I didn't do right in front of all my coworkers in a meeting. I froze, and felt like crap for not defending myself. I am glad I kept my cool, cause it wouldn't matter what I would have said, It would be spun to make out to be crazy. Hoping I get the ball rolling next week.